Searching for a sinfully delicious, guilt-free Mother's Day and Administrative Professional Day gift that will be remembered for all the right reasons? Want to make sure your recipient actually enjoys every last bite of roasted goodness? Ready to go above and beyond and introduce some lucky people to unparalleled flavor sensations? Lager Peanuts, Stout Cashews, and Whiskey Almonds round out this three-nut sampler that's sure to turn even the most indifferent average Joe into a serious nuthead. Quality You Can Crunch: We handcraft all our fantastically fresh nut flavors and roast them in small batches, which makes for a superior snack every time. That's why we've been featured on the likes of Rachael Ray and Food Factory. When it comes to salty, sweet, savory treats, we've been pushing the boundaries for 21+ years. You're about to find out just how yummy a nut can be. It's Never The Wrong Time For Nuts: Whether it's a happy anniversary, birthday, Mother's Day, or Administrative Professionals' Day, they're going to feel the love when they pop the top on this tub-full of nuts. And if you're really lucky, they'll even share! Order Your Sugar Plum 16oz Beer & Whiskey Giftable Gourmet Nut Assortment Today! NUTS FOR EVERYONE: Expertly handcrafted and roasted in small batches, Sugar Plum nuts are the heart-healthy gift for any occasion. A perfect gift for Mother's Day and Administrative Professionals' Day! 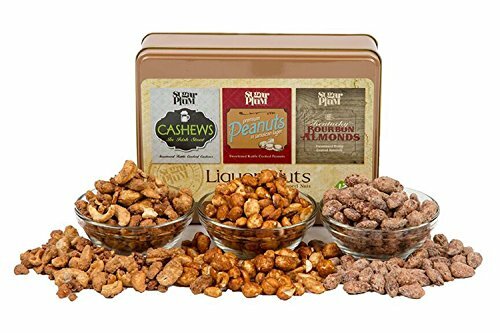 TANTALIZE YOUR TASTEBUDS: This 16oz giftable tin includes 3 unique varieties: Lager Peanuts, Stout Cashews, and Whiskey Almonds. UNPARALLELED QUALITY: Sugar Plum is known as the masters of creating tasty flavor combinations that no one else would dare to try. ZESTY YET HEALTHY: Want to make sure you're giving something that's as tasty as it is healthy? Nuts are just the thing. If you have any questions about this product by Sugar Plum Chocolates, contact us by completing and submitting the form below. If you are looking for a specif part number, please include it with your message.